A judge from Alameda County ordered Safeway, the parent company for six San Luis Obispo County Vons grocery stores, to pay $9.87 million to 42 California counties and two cities for the illegal dumping of chemicals and medicines. In the case, the San Luis Obispo County District Attorney along with 43 other attorneys alleged that more than 500 Safeway owned stores had disposed of hazardous and pharmaceutical waste in local landfills that were not authorized to handle that type of waste. The award includes a $25,900 settlement to San Luis Obispo County. In addition, Safeway agreed to spend $200,000 to help fund environmental enforcement and hazardous material investigation trainings to be held in San Luis Obispo County. Safeway also agreed to continue its store-level management program which is designed to address environmental compliance, to conduct annual dumpster audits and to work with state and federal agencies to promote regulatory reform. Big surprise …Safeway is owned by the mormom church, and look what they’ve been dumping for over a hundred years. @lbertsons is owned by the three headed dog , gate guard of Hades, Cerberus. Actually, Albertsons now owns them… they will be divesting many stores (where both a vons/safeway and alberstons co-exist). all that money to punish an organization in the name of the people but the only people who benefit are those who impose the punishment….. In Mexico you get pulled over and you must put some money in their hand, that simple. Here we bate then prosecute big Corps for big bucks. This money provides jobs that will make things better and when they spend it all on studies, down goes another sleeping giant. Boo Hoo. How much crap do you think the average Joe is dumping into the landfill; electronic toxins, batteries, lotions, pills. If the California voter can only pick prostitutes for government, do you think they’re smart enough not to throw away toxic items into their trash? And what about the blithering idiots that don’t vote (and probably shouldn’t), do you think they’re any smarter? The public should be more outraged at all the product displays that Vons keeps sticking in their grocery aisles that make it impossible to push your cart through the store. The biggest joke here is that our genius elected officials think that by keeping plastic bags out of our landfills, they are saving mother earth. 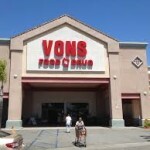 Ha Ha VONS……you deserve the bad PR – you welcomed the bag ban so you can make 1000% profit on your crap paper bags. I SHOP AT WALMART (when ever I can)! Screw you VONS. Please look above at ‘You may also want to read’ :” Walmart pleads guilty to federal environmental crimes”. And the public will forget about it by tomorrow.